The Notice to Employer and Employee is a general labor law poster poster by the Arkansas Department Of Labor. This poster is mandatory for some employers, including employers with 4+ employees. This poster must be posted in a conspicuous place where all employees will see it in a company with 4 or more people in it. This poster talks about the Minimum Wage requirements of the state, who the Minimum Wage Law applies to, as well as rates for students and work week maximums for students. This poster also lists requirements on how to deal with handicapped workers, student-learners, overtime, Child Labor Laws and everything else having to deal with wages. Penalties for employers breaking any of these requirements is also listed on this poster. AR All-In-One Labor Poster: Instead of printing out dozens of posters, employers can also purchase an all-in-one poster that covers both Arkansas and Federal poster requirements by clicking here . It appears you don't have a PDF plugin for this browser. Please see the link below to download arkansas-amwa-poster-010119.pdf. of four (4) or more persons . *Executive, administrative or professional employees. *Students who work in the schools they are attending. *Employees of the United States . subject to a gratuity allowance. contact the Department of Labor. records having to do with wages and hours. the law is being obeyed. (c)  enforce all regulations issued thereunder. authorized in writing by the employee. supplying items or services to the employee. for a period of three (3) years. overtime wages, to which the employee is entitled. to be due, to be paid as liquidated damages. the age of 16 to have employment certificates. baseball clubs, or sports referees . *More than 8 hours a day. *More than 6 days a week. *More than 48 hours a week. *Before 6:00 a.m. nor after 7:00 p.m.
such children may work until 9:00 p.m.
their parents or guardians during school vacation. *Mo re than 54 hours a week. *Before 6:00 a.m. nor after 11:00 p.m.
except that the limitations  of 6:00 a.m. and 11:00 p.m.
available from the Department of Labor . PLOYERS SUBJECT TO THE MINIMUM WAGE ACT ARE REQUIRED TO POST THIS NOTICE IN A CONSPICUOUS PLACE FOR ALL EMPLOYEES. There are an additional two optional and mandatory Arkansas labor law posters that may be relevant to your business. Be sure to also print all relevant state labor law posters, as well as all mandatory federal labor law posters. 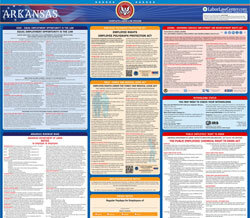 Instead of printing out pages of mandatory Arkansas and Federal labor law posters, you can purchase a professional, laminated all-in-one labor law poster that guarantees compliance with all Arkansas and federal posting requirements. Fully updated for 2019! While we do our best to keep our list of Arkansas labor law posters up to date and complete, we cannot be held liable for errors or omissions. Is the poster on this page out-of-date or not working? Please let us know and we will fix it ASAP. LaborPosters.org will email you a printable PDF of this Arkansas labor law poster, 100% FREE. You'll also get notified when new posters are available. Your Arkansas poster has been downloaded and emailed! This poster download is provided as-is, with no warranty or guarantees. Please verify with Federal and Arkansas authorities to confirm that you are posting all of the correct (and updated) posters required for your type of business. Instead of printing out pages of mandatory Arkansas and Federal labor law posters, you can purchase a professional, laminated all-in-one labor poster.